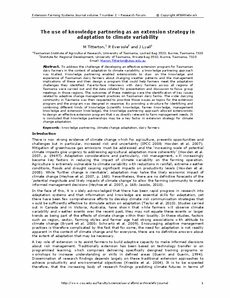 To address the challenge of developing an effective extension program for Tasmanian dairy farmers in the context of adaptation to climate variability, a knowledge partnering approach was trialled. Knowledge partnering enabled extensionists to draw on the knowledge and experience of Tasmanian dairy farmers about changing weather patterns and the management implications of these and then design a program that could help farmers meet the adaptation challenges they identified. Face-to-face interviews with dairy farmers across all regions of Tasmania were carried out and the data collated for presentation and discussion to focus group meetings in those regions. The outcomes of these meetings were the identification of key issues related to adaptive change management practices on Tasmanian dairy farms. The wider dairying community in Tasmania was then requested to prioritize those issues as topics for the extension program and the program was designed in response. By providing a structure for identifying and combining different kinds of knowledge (scientific knowledge, farmer knowledge, management knowledge and extension knowledge), the knowledge partnering approach allowed extensionists to design an effective extension program that was directly relevant to farm management needs. It is concluded that knowledge partnerships may be a key factor in extension strategy for climate change adaptation.